The FlowRider is one of the safest, most durable products in the industry, and the FlowRider Double will double your fun in every way. Double your revenue and your capacity by using our patented FlowFence, which creates two lanes to ride in. For private events, expert riders or special ride times that use the entire 59 sq meters (630 sq ft) of available carving space, then take out the FlowFence and Double the effective ride area!! Add to that the 240 horses of power under our hood and you have a sensational combination of speed, power, and ride surface. Dig in, lay it down, and charge! The FlowRider Double is also a key ingredient to the success of Wave House Sentosa in Singapore. “Newbies” learn the trade on the Double before applying their well honed skills to attack the FlowBarrel Ten – and necessary skills they are! The FlowRider Double is also a staple of the Wave Loch FLOW Tour. 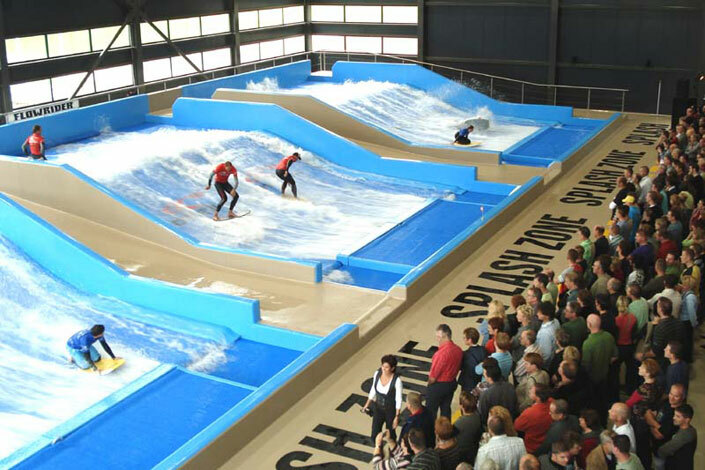 This Tour travels across the US, Asia and Europe and the FlowRider Double is the marque product that signifies forward thinking and operational excellence in every way! Skill Vs. Thrill – Boardsports such as surfing, snowboarding, skateboarding and flowboarding are skill-based activities that challenge riders to develop new tricks to emulate their heroes. By comparison, the typical water park or theme park rides are thrill-based rides. No skill is required and no reward or accomplishment is earned. The more you ride a thrill ride the less thrilling it becomes. This is what we call thrill fatigue. Wave Loch’s skilled-based technology is the antidote to thrill fatigue. The adrenaline rush of successful challenges met, inspires riders to achieve a never-ending cycle of skill based reward, thereby increasing rider visitations and loyalty. The Lifestyle – Wave Loch DNA is a double helix of wave calculus and wave riding passion. We surf. We live and work at the beach. We infuse our products with our passion and stay close to our roots. Our products are icons of the California beach lifestyle. Wave Loch attractions create an emotional connection to the multibillion dollar board sports industry. Our wave technologies attract the valuable youth market, families and boardsport enthusiasts. When orchestrated correctly, the lifestyle identification inherent in Wave Loch technologies can increase venue revenues beyond those generated by the waves, including sales of food and beverage, retail products, sponsorship opportunities and corporate and competitive events. into flowboarding. This new alternative board sport is taken seriously from the mountains to the sea. Flowriding will energize your facility with aspiring athletes (and ‘wannabes’) who will pay again and again to enhance their board riding skills. Not only does this repeat business enhance revenue and spread word of mouth, but the better a rider gets, the greater the show for your viewing audience. Safety – Thrilling to do, thrilling to watch, our ride is designed to handle wipeouts. The FlowRider‘s waveform is a proprietary composite membrane ride surface that is designed to absorb the energy of impacts. Flowboarders may wipe out, but they’ll get back up again and again and again.